THE Employees Provident Fund (EPF) is set to declare its annual dividend for 2018 anytime now and anyone who has been paying any attention would know that the odds of it outperforming that in 2017 are low. Not only was last year’s EPF dividend the highest payout in 21 years, nearly every major asset class globally — from stocks and bonds to crude oil and bitcoin — had little or negative returns for 2018. Even so-called havens such as gold and US Treasuries did not do that great year on year. Blaming the US Federal Reserve’s accelerated monetary policy tightening, some fund managers have reportedly lamented how the broad pullback was worse than the rout in 2008 and a stark contrast to the rally in 2017. In 2018, the MSCI World Index was down 8.2% (+23.07% in 2017), the MSCI World High Dividend Yield Index was down 6.7% (+19.17% in 2017), the MSCI Emerging Markets Index tumbled 14.3% (+37.75% in 2017) and the MSCI ACWI — which includes developed and emerging market countries such as China, India, Korea, Brazil and Russia — lost 8.93% after gaining 24.62% the year before. Malaysian equities were not spared. The bellwether FBM KLCI closed 2018 nearly 6% lower while the broader FBM Emas skidded close to 11% last year. Yet, some have seen it fit to blame the EPF’s likely lower year-on-year dividend rate for 2018 on local politics, not unlike how there were curious claims of a correlation between who the incumbent prime minister was and the high EPF dividends in 2017. Let’s set politics aside and take a more objective look at the investment numbers that the EPF has announced so far to see if its dividend rate for 2018 will be close to 5% or 6%. 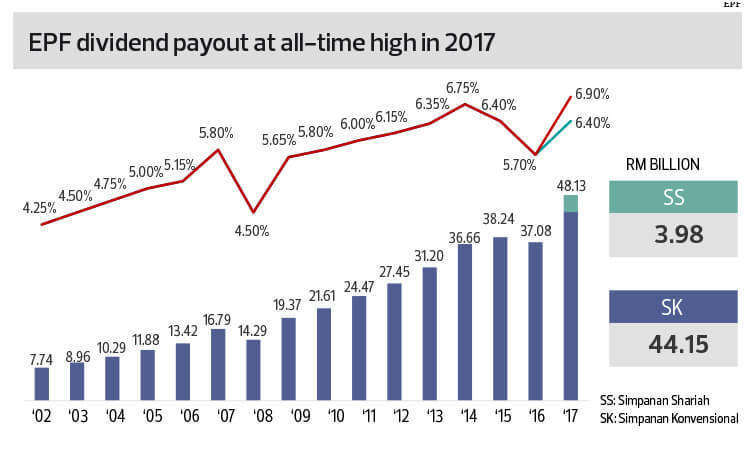 For the record, the EPF’s 6.9% dividend for 2017 was the highest since the 7.7% dividend declared for 1996, the year before the Asian financial crisis. The 6.4% maiden dividend declared for its Simpanan Shariah portfolio for 2017 was also 2.61% above the inflation rate of 3.79% last year. The EPF, which needs to generate consistent and sustainable returns to preserve its 14 million members’ retirement kitty, only needs to deliver at least 2.5% nominal dividend and beat inflation by at least 2% on a rolling three-year basis. The EPF’s fund size is also a growing challenge. Members’ savings have grown an average of 10.98% a year since 1990 to reach RM768.51 billion as at end-2017 (RM700.75 billion conventional and RM67.76 billion under Simpanan Shariah). As at end-September last year, accumulated contributions reached RM785.59 billion for its 14.1 million member base, of which 7.2 million were active (contributing). Between 2007 and 2017, dividends declared by the EPF had been trending upwards except for 2008, 2015 and 2016, the years when the local stock market fell. In 2008, the year the FBM KLCI fell a whopping 38.9%, the EPF’s dividend saw the largest year-on-year decline of 130 basis points from 5.8% in 2007 to 4.5% in 2008. Nonetheless, it is worth noting that one of the largest year-on-year gains in the provident fund’s dividend rate — a 115-basis-point jump — was recorded in 2009 (5.65% dividend rate) while 2017 saw a 120-basis-point jump to 6.9% from 5.7% in 2016. To pay 2017’s dividend last year, the EPF needed a total of RM48.13 billion, or RM7.02 billion to pay every 1% dividend for its conventional and shariah-compliant portfolios. The 2018 dividend for Simpanan Shariah would only be its second, having paid a total of RM3.98 billion or a 6.4% rate last year. For the conventional portion alone, the EPF needed RM44.15 billion, or RM6.4 billion for every 1% of the 6.9% dividend rate last year. 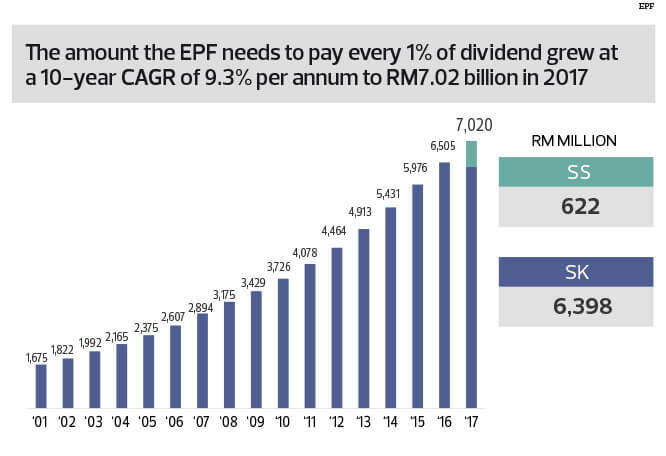 The amount that it needs to pay 1% of dividend has grown at a 10-year compound annual growth rate (CAGR) of 8.26% — the EPF needed only RM2.89 billion to pay 1% of dividend in 2007. That means the EPF could need at least RM7 billion to pay 1% of dividend for its conventional portfolio this year — that’s not counting the additional money it needs to pay returns for members with the shariah portfolio. The shariah portion would change the 10-year CAGR to 9.27% and bring the amount needed to cover 1% of dividend closer to RM7.7 billion, back-of-the-envelope calculations show. Put another way, the EPF will likely need to have RM35 billion to RM40 billion to pay a 5% dividend for 2018. For a 6% dividend, the EPF would probably need to have made RM42 billion to RM46 billion last year — which means a 6% dividend for 2018 is a tall order in a tough year. Even if the figure is likely lower year on year, the returns are still no small feat for a fund like the EPF, which cannot take on too much risk due to the need to preserve capital. Did it make enough for a 6% dividend? For 2017, the EPF’s gross investment income stood at RM48.54 billion (conventional) and RM4.6 billion (shariah), which adds up to RM53.14 billion. According to the EPF’s unaudited figures for the first nine months of 2018, its quarterly investment income was higher year on year, with investment income at RM12.88 billion (1Q2018), RM12.39 billion (2Q2018) and RM14.61 billion (3Q2018), bringing the unaudited total to just under RM40 billion, which may well be subject to adjustments and write-downs, if any, in the final quarter. That means a 5% dividend should be possible, even if the fourth-quarter income is a lot smaller. The wild card, of course, is the impact of potential write-downs. Fourth-quarter figures had not been released at press time and may only be out in April when its annual report is released but the dividend rate is likely to be declared anytime this month. Ten of its past 13 annual dividend announcements have been in February, with the exceptions being in 2008 and 2009 when the rate was announced by mid-March. For 2007, the dividend rate was announced on Jan 31, 2008. 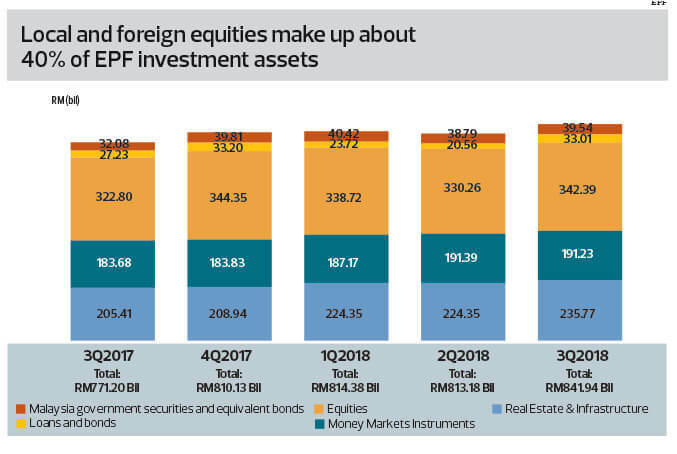 The EPF has yet to release its top 30 equity holdings in Malaysia as at end-2018, with data on its website being that of end-September 2018, at the time of writing. Based on the 35 stocks that were on its top 30 holdings the past four quarters and its shareholding level from stock exchange filings as at end-2018, however, the value of these 35 EPF holdings would have fallen by roughly RM7.5 billion as at end-2018 versus end-2017 — if one were to make a simplistic assumption that its shareholding a year ago was the same as end-2018. The largest declines were from Telekom Malaysia Bhd, Axiata Group Bhd, Sime Darby Plantations Bhd, Tenaga Nasional Bhd, CIMB Group Holdings Bhd, Malaysian Resources Corp Bhd, IJM Corp Bhd, Digi.com Bhd and Maxis Bhd while the largest gains were seen at Public Bank Bhd, Hong Leong Bank Bhd, PPB Group Bhd and RHB Bank Bhd. But the estimated RM11.8 billion decline in market value versus RM4.2 billion estimated gains in market value are a mere guesstimate, at best, and may not mean there will be sizeable equity write-downs. It is worth noting that the EPF has been building a steady income stream, likely with the desire to at least meet its annual minimum dividend payout requirement, come what may. In 2017, dividends on investments came to RM10.33 billion, being 19.4% of total gross investment income. The steady stream of interest and profits it has from its investments gave it another RM13.93 billion in 2017, or 26.22% of gross investment income. In other words, these two income streams alone were enough to pay about 3.4% or nearly half of the EPF’s dividend payout last year. So while EPF chairman Tan Sri Samsudin Osman did not give away much on Jan 15 when asked about the potential dividend payout for 2018, it is clear that the tough market conditions last year has put the fund’s defensive strategy to the test. Should its defensive strategy bear fruit, the stage is set for it to take a pat on the back. If it has been found wanting, a clear direction would be necessary to show that the EPF can rebound stronger than ever this year.